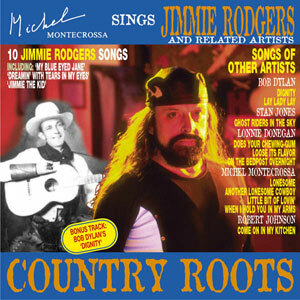 The Mira Sound Germany Audio-CD ‘Country Roots’ – Michel Montecrossa sings Jimmie Roders and related Artists features 10 Jimmie Rodgers songs including ‘My Blue Eyed Jane‘, ‘Dreaming With Tears In My Eyes‘ and ‘Jimmie The Kid’ as well as songs of related artists: Michel Montecrossa will be presented with the songs: ‘Lonesome’, ‘Another Lonesome Cowboy’, ‘Littel Bit Of Lovin” and ‘When I Hold You In My Arms’ and Bob Dylan with the songs ‘Dignity‘ and ‘Lay Lady Lay’. In addition there are three treasures of Stan Jones, Lonnie Donegan and Robert Johnson: ‘Ghost Riders In The Sky’, ‘Does Your Chewing Gum Loose Its Flavor On The Bedpost Over Night’, and ‘Come On In My Kitchen’. ‘Ghost Riders in the Sky’ the cowboy-myth by Stan Jones, the hilarious Lonnie Donegan skiffle song ‘Does Your Chewing-Gum Lose Its Flavor on the Bedpost over Night’ and the profound Robert Johnson blues ‘Come On In My Kitchen’ are included by Michel Montecrossa “as three examples of artists and songs of different times and backgrounds who share that stream of expressiveness which you can’t kill by defining it, because it will overflow every circle you draw around it. Due to tuberculosis his life was short, beginning in poverty but it was crowned for a few quickly fading years by an immensely creative career. Born on 8th September 1897 in Pine Springs, Mississippi as the son of a railway foreman he made his way through as brakeman with little to lose and all to win. In 1924 he turned to songwriting and performing. In 1927 his music rose to popularity and from then on he bravely fought the battle against death with one song after the other, right to the end. His body died on 26th May 1933 in a New York hotel while working on his last recording. But his soul is ever present in his music with the freshness of self-renewing life, the simple mystery. Mira Sound Germany presents with the ‘CyberRock Ecstasy’ New Year Concert 2001 CD-Plus Production full power CyberRocker Michel Montecrossa. 14 Soundtracks and one Music Video highlight the magnificent atmosphere of Michel Montecrossa’s New Year Concert 2001. With the CyberRock Ecstasy Concert Michel Montecrossa is opening a new dimension of his abundant creativity entering the stage as the 2001 CyberRocker with a New Sound, New Style of Lyrics and the Drive of Cyberage. The Interactive Mira Sound Germany CD-Plus ‘Time To Change – Michel Montecrossa sings Françoise Hardy and Himself’ for the first time presents songs originally performed by Françoise Hardy in the interpretation of Michel Montecrossa together with songs written by Michel Montecrossa. The ‘Time To Change’ soundtracks feature 9 Françoise Hardy songs and 9 Michel Montecrossa songs creating in their union the fascinating and superb atmosphere of the ‘Time To Change’ album. ‘Time To Change’ is romantic and sensual as well as powerful and profound and unfolds the theme of love, loss and finding, of struggle and happiness, of tenderness and concern in the heart-felt way which is natural to Françoise Hardy and Michel Montecrossa. The Music-Video of the Michel Montecrossa song ‘Splendors Of True Love’ visualizes this intimate quality of the ‘Time To Change’ album with its touching and unpretending warmth of feeling. 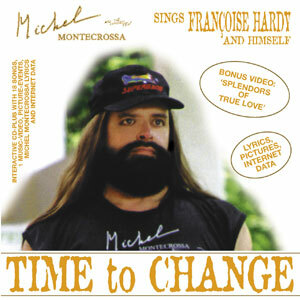 ‘Time to Change – Michel Montecrossa sings Françoise Hardy’ interactive CD-Plus with 18 soundtracks, 1 Music-Video, Pictures, Lyrics and Internet-Data. Produced by Michel Montecrossa and released by Mira Sound Germany.